When it comes to tree nuts, fire ants can cause significant yield and quality loss. In citrus, fire ants pose a worker safety concern. Altrevin Fire Ant Bait Insecticide helps protect both crops and labor by providing growers with the fastest way to knock down fire ant populations. Altrevin fire ant bait insecticide is designed to be passed from ant to ant. Currently, the majority of products available on the market are insect growth regulators — these can take one to two months to be effective, because they act on the fire ants’ hormonal and reproductive systems. In fact, studies show that Altrevin fire ant bait insecticide can knock fire ant populations down more than 90 percent in just seven to 14 days, compared to the industry standard of one to two months. Altrevin fire ant bait insecticide provides long-lasting and consistent length of control. And field trials prove that Altrevin fire ant bait insecticide delivers control of fire ants that lasts up to eight weeks. 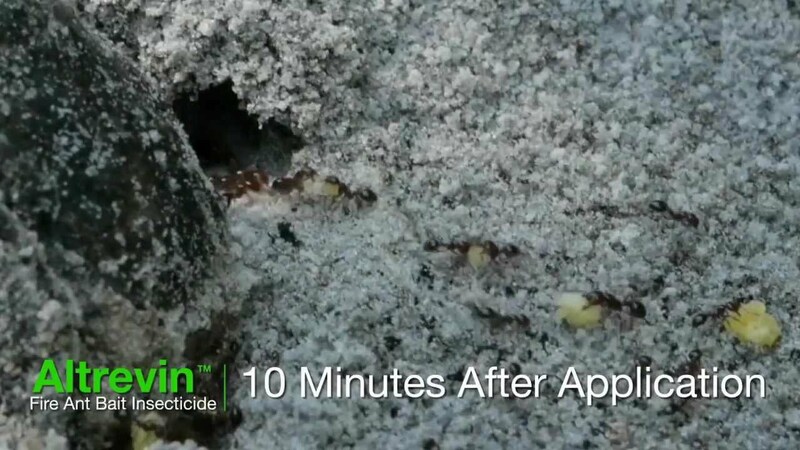 Because of Altrevin fire ant bait insecticide’s fast speed of kill, it allows you the flexibility to use it when you need it most, and you can time applications for when you can get in the field. You can even use it before harvest to help protect your workers in the field.